In a sprawling convention centre in Essen, western Germany, the busiest day in the German board games calendar – Saturday at “Spiel” – is about to begin. Hall after hall of stands are piled high with board game boxes, most eschewing the garish graphics of the toy shop for evocative paintings of lands far off and times long ago. A few minutes before the official start time of 10am, the doors are thrown open. There’s a rumble and then a roar as thousands of gamers surge into the hall, breaking and swirling around the stands, sweeping into the farthest corners of the halls, seeking out rare second-hand products or the hottest of the 500 new games being launched, or simply a good place to sit and play. The biggest stands resemble pavement cafés whose patrons grab games instead of coffee: they are filled with tables, each just big enough to seat four players and a board. Before long, the spaces in between the tables are colonised, too, with gamers sitting cross-legged around their boards. Beyond the sheer number of enthusiasts, the striking thing is that they look, well, normal. The convention centre boasts nearly as many mothers with prams as heavy-metal-T-shirted, body-pierced teens. In one of the farthest halls, Dungeons and Dragons merchandise is on sale, and I counted more than one person wearing a sword and a cloak. But for the most part, the convention centre’s population wouldn’t look out of place on any German high street. Wallace recalls an occasion when a group of his gaming friends were too embarrassed to admit their identities to a pretty waitress back home in the UK. “One of us told her that we were stamp collectors. I thought: great. We’re lower than stamp collectors.” But in Germany, if the leading game designers travel incognito, it is to avoid being surrounded by admiring fans. A queue of autograph hunters forms at the Kosmos company’s stand: Klaus Teuber has arrived. Teuber, once a manufacturer of dental supplies, is an unlikely star. He is an avuncular man in his fifties with a hairless pate and a perfect trapezoidal moustache that fans out to the corners of his mouth. But for four days in Essen, he is the biggest name of all: the designer of the multimillion-selling blockbuster board game, The Settlers of Catan. In 1996, when I was living in Oxford and studying economics, I tagged along one night to the home of a friend of a friend, where I was invited to play something called “Settlers”. Not the most daring of evening activities, but I shrugged and agreed. I’d played chess as a child, wargames as a teenager, so why not try this strange and rather beautiful board game? Someone offered a cursory explanation of the rules, and I duly proceeded to come fourth out of four players. But it was fun. The Settlers of Catan superficially resembles Monopoly. The board is assembled from hexagonal tiles, but the components include wood houses that look much like Monopoly buildings. The idea is similar, too: players use resources (money in Monopoly; timber, wool and other commodities in Settlers) to build property; the property then collects further resources, and the process of expansion continues. Yet after Monopoly, Settlers was a revelation. Monopoly ends in the slow strangulation of the weaker players and usually feels stale long before the official end, assuming it isn’t abandoned along the way. Settlers didn’t take long – perhaps an hour – and even as it was coming to an end, every player was still involved. In Monopoly, many choices can be made on autopilot; in Settlers, there is scope for skill throughout a game: the decisions always matter and are always interesting. Settlers has its own elegant economy, in which the supply and demand for five different commodities are determined by tactics, luck and the stage of the game. Players constantly haggle, wheedle and plead. It’s convivial experience, a game of incessant banter. In the course of an evening, I was hooked. 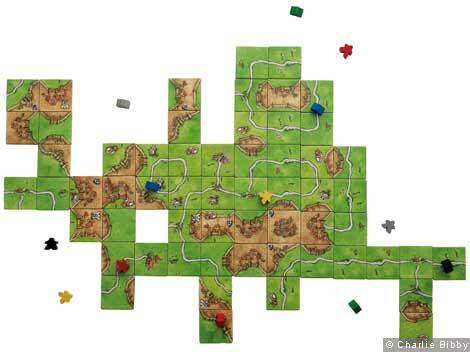 Settlers is the game that brought “German-style” or “Eurogame” board games to the attention of an English-speaking audience. The board game market in Germany is more like the book market in other countries: several hundred new games are launched there every year – typically either at Essen’s Spiel convention in October or the Nuremberg Toy Festival in February – and each year, at least one new game will sell hundreds of thousands of copies, perhaps millions, as Settlers has. There are evergreen games, briefly fashionable sensations and flops. There are, in fact, many more than two schools of thought about why Germany is the world’s board game superpower. It could be the enthusiasm of the citizens. In a country such as Britain, it is downright odd to pull a board game out of a cupboard and offer to teach it to friends alongside after-dinner coffee. In Germany, people do that and more. They discuss old games and act as evangelists for new ones. Naturally, the games are better as a result. The cause could also be Germany’s pluralistic gaming tradition: most countries play games, but German gaming has never been dominated by a single game – unlike Japan (Go) or Russia (chess). But it could also be the influence of a single pioneer, Erwin Glonnegger. Born in southern Germany in 1925, Glonnegger joined the publisher Ravensburger after the war, where he became its first board game “editor”, working with designers through the 1950s and 1960s to produce a series of elegant games now considered timeless. By the late 1960s and early 1970s, German newspapers were running columns about “family games”. There may have been a social motive – board games were, and still are, regarded as a wholesome activity – but the columns reflected the genuine enthusiasm of mainstream journalists who persuaded their editors to let them moonlight as game critics. In 1978, those enthusiasts decided to create an award, the Spiel des Jahres (Game of the Year). The first prize was handed out in 1979, to Hare & Tortoise – ironically, an import from England. And it is in England that the world’s most prolific game designer now lives. Reiner Knizia, the winner of “Spiel des Jahres” for both adult and children’s games in 2008, designs almost 50 games a year. He puts on a suit and tie every morning, then steps into his office in the sitting room of his home in Windsor. His filing cabinets are packed with the fiddly paper prototypes of nascent games, his mantelpiece stuffed with awards. A secretary assists his work. As one of the few professional game designers working full-time, Knizia says he is able to offer publishers a range of related products – here a franchise game (The Lord of the Rings board game is Knizia’s bestseller), there a card game spin-off or an expansion set. He’s also interested in the latest technology. He designed a game using electrically conductive paint and playing pieces with computer chips inside them, so that the board can talk to the players. He describes his latest explorations, investigating the potential of ultraviolet paint and ultraviolet light – “ultraviolet lamps are now so cheap” – to reveal hidden information during play. After decades of growth (Knizia guesses double-digit growth), the German gaming industry is slowing down. Martin Wallace of Warfrog describes Germany’s gaming market as “a slowly collapsing universe”; André Maack of the board game giant Ravensburger is more optimistic, but even he sees board games taking a growing market share of a flat hobbyists’ market. At Essen, though, there is no sign of an industry in stagnation. And the business, while small-scale compared with movies and computers, or even books, is full of entrepreneurial characters. In a makeshift office tucked away behind one of the stands, I met Jay Tummelson, who has done more than anyone to bring Eurogames to the rest of the world. A likeable, fast-talking and opinionated American in his mid-sixties, Tummelson owns the company Rio Grande Games. Its stand is almost as large as those of the industry giants, the Ravensburgers and Mattels, but there are no 20ft signs, stages, or gantries. The stripped-down approach is emblematic of Tummelson’s business model, which is to produce a vast range of gamer-friendly, no-frills translations of German games for the English market. He does business with all the major German publishers, accepting their game design and artwork, sharing their production costs and adding his own English print run to the end of theirs – typically producing 2,000 English versions on top of the 5,000 German originals. Tummelson throws these games into a growing market and reprints at much larger volumes whenever he has a hit on his hands. And he’s had quite a few hits. Before founding Rio Grande Games, Tummelson imported Settlers – and he is responsible for producing the English versions of most recent Spiel des Jahres winners. When I suggest to Tummelson that he has, almost single-handedly, brought German games to the rest of the world, he demurs. “I played my part, but the internet was by far and away the most important thing.” German games’ successes may depend on personal recommendations, but in the UK and the US, gamers are spread too thin to speak to one another directly. 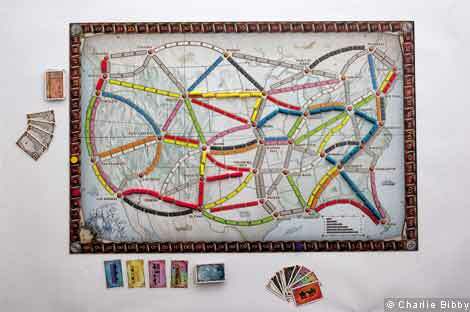 Ironically, rather than wiping out board games, computers have provided the connections for once-isolated games in the UK and US to swap ideas online and meet up over the gaming table. At the Kosmos stand, Klaus Teuber is still patiently signing autographs and talking to fans. I lurk at the end of the queue and persuade him to go for coffee. We perch at a breakfast bar in the press centre while, in halting English, he explains why board games have withstood the onslaught of games consoles and PCs. “You can know someone for 10 years,” explains Teuber with some passion, “and the first time you play a game with them you see a side you never saw before. But when you’re playing a game on your PC, you’re just playing a computer’s artificial intelligence. This is a partner with no emotion. You can’t see the computer smiling. You can’t see the computer… what’s the word?” He presses his fists to his head. 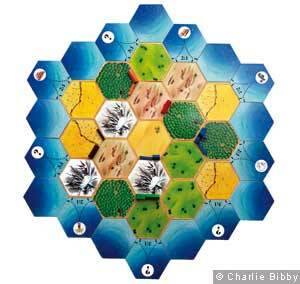 As with other board games, computers only seem to have strengthened The Settlers of Catan. There’s an online version of the game which connects players to other players in the same city. They start playing online, but often then arrange to meet over a gaming table somewhere in the real world.